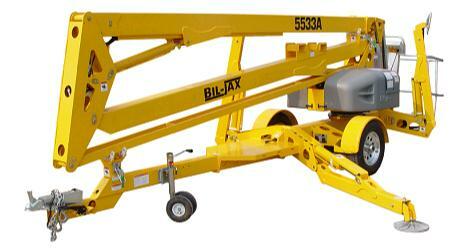 The new 5533A Articulated Aerial Work Platform. The trailer-mounted boom lift provides 61' of working height, 33' outreach, 23 'up and over height, and features an automatic, self-leveling hydraulic outrigger system that allows for setup in 30 seconds when all four outriggers are deployed simultaneously. The 5533A can be operated from either the platform or ground control station. Both feature a display panel with control buttons that are logically positioned around a single machine image for easy identification of button functions. * Please call us with any questions about our towable manlift 55 ft 2 man rentals in Omaha NE and Western Iowa.